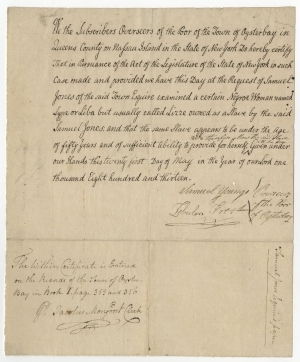 Samuel Young and Zebulon Frost, “Overseers of the Poor of Oysterbay” certify that a slave named Lizzie is freed. [SLAVERY]. Manuscript Document Signed. New York, N.Y., May 21, 1813. 1 p., 8 x 9½ in. With endorsement of the town clerk, Jacobus Monfoort. In 1785, the New York Assembly began considering ways to abolish slavery. Some representatives, including Aaron Burr, favored immediate emancipation, while another faction supported gradual emancipation. After failing in the 1780s (largely over disagreements regarding free black voting rights) the New York Legislature passed An Act for the Gradual Abolition of Slavery in 1799, with no conditions on voting rights. The act provided freedom for children born to slave mothers after July 4, 1799. Males were freed at age 28; females at age 25. Slave owners could continue to exploit a slave’s most productive years well into the nineteenth century. Moreover, kidnappings and illegal trading allowed New York owners to dispense with their human property even after the law took effect. Samuel Jones was a member from Queens County of the New York State Assembly from 1786 to 1790. He was elected a delegate to the Continental Congress in 1788, and on February 17, 1797, the office of New York State Comptroller was created by the New York State Legislature to succeed the State Auditor. On March 15 of that year, Jones was appointed by the Council of Appointment the first holder of the office, serving until 1800. Great Jones Street in New York City’s NoHo district is of his namesake. Fine, usual folds as expected.